The holiday months from Halloween through Valentine’s Day and to a lesser extent Easter are prime seasons for sparkling wines. The last few years have witnessed the rise in popularity of one sparkler in particular, Italian Prosecco. The combination of improved quality, value for the price, and savvy marketing have positioned this wine style as the latest trend in many consumers drinking choices. So to toast a new year, I’ll delve a little deeper into the world of Prosecco. Prosecco hails from the Trieste region of Italy in the far northeast of the country along the Alpine borders of Austria and Slovenia. The wine is produced in both the provinces of Veneto and Friuli-Venezia Giulia. The name comes from the town of Prosecco which is now a suburb of the town of Trieste. The wine is primarily produced however from the towns of Conegliano and Valdobbiadene in the hills north of Treviso near Venice, which account for more than 60% of all Prosecco wine. The history of Prosecco supposedly dates back to antiquity as the descendent wine of Pucino mentioned by Pliny the Elder in Naturalis Historia. Most likely the association was a 16th century marketing coup providing a regional distinction to the Ribolla wines of the region versus those of Gorizia and Istria, claiming the ancient castellum nobile vinum Pucinum mentioned by Pliny was in fact the Castello di Moncolano (also known as the Torre di Prosecco or Tower of Prosecco). Regardless, by the mid 1700’s the wines of Prosecco were noted by numerous authors and renowned for having a pleasant apple bouquet. However, most Prosecco wines were produced in a sweet style similar to the wines of nearby Asti up until the 1960’s. Improved quality control and an effort by the Consortium for the Protection of Prosecco from Conegliano and Valdobbiadene to appeal to the consumers of drier Champagnes led to the development of the light, crisp Prosecco styles available today. One of the distinguishing factors between Prosecco and other sparkling styles is that Prosecco is predominately produced through the Charmat method versus Méthode Champenoise. The wine undergoes the secondary fermentation which provides carbonation in pressurized stainless steel tanks versus the bottle fermentation of Champagnes. The Charmat process is much more cost effective than Méthode Champenoise, and is one of the main reasons Prosecco is such a value versus other sparkling wine styles. The Charmat method is effective as it works best for light, fresh wines intended for early consumption, while the complex flavor profile obtained by yeast autolysis during bottle fermentation allows for extended aging of Champagne and other Méthode Champenoise wines. Some Prosecco from Valdobbiadene does undergo bottle fermentation in what the Italians call Metodo Classico style. Prosecco originally was the name of the grape used in production, as well as the regional name given to the wine. However, as other regions of the world began producing Prosecco wines in the late 1990s and early 2000s, the Italian producers saw the value in protecting the regional name. The official name of the grape is now Glera, and Prosecco is a DOCG controlled classification under European law and international treaties. Prosecco is produced either as full sparkling wine, known as spumante, or as a lightly carbonated wine, known as frizzante. Full spumante versions often contain Pinot Grigio or Pinot Bianco in in the blend as well as Glera. The wine ranges in sweetness from the sweeter “Dry” to the somewhat sweet “Extra Dry”, to the light and crisp “Brut” wines which contain little to no perceptible sweetness. The wine is usually low in alcohol, around 11 or 12 percent by volume. Proseccos age similar to most white wine styles due to the Charmat method and should be consumed as young as possible. The flavor of Prosecco is typically light and crisp with intense aromatic profiles of apple, pear, white peaches and apricots. Prosecco is often consumed as an aperitif, and frequently used in cocktails such as Mimosas or classic Bellini. The appeal of Prosecco is no surprise. Like most sparkling wines, it’s festive and food friendly. The flavors are bright and fruity, and the quality for the value is outstanding versus Champagne, which is more of a luxury purchase. 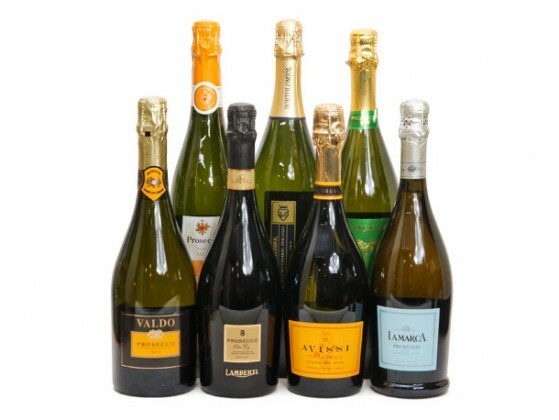 Prosecco makes an excellent addition to the everyday wine cellar as a sparkling wine on-hand. No need for celebration required.